Infused with citrus oils, this wonderfully uplifting conditioner containing active organic Aloe Vera is the ideal pick-me-up to start your day. Organic Aloe Vera known for its beneficial qualities. Bursting with aromas to energise your day. Made with Organic Aloe Vera which contains many enzymes, amino acids and polysaccharides. 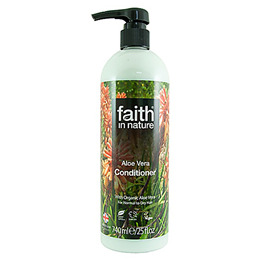 Below are reviews of Faith in Nature Aloe Vera Conditioner - 740ml by bodykind customers. If you have tried this product we'd love to hear what you think so please leave a review.